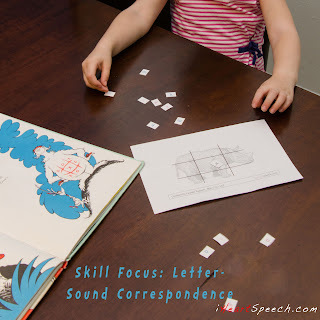 Our first Skill Focus for If I Ran the Zoo by Dr. Seuss will be Letter-Sound Correspondence. The research shows that being able to quickly and accurately name letters is a good predictor of later reading success. That's good news since working on letter names (and then letter sounds later) can be a lot of fun! The key is to work at your child's level and then increase the difficulty just a little. Then when he can do that, increase the difficulty just a little more. 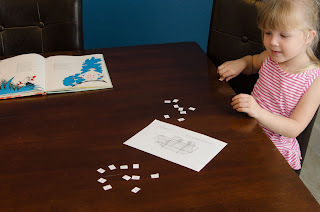 A good, and fun, way to practice letter names and sounds A LOT is while playing tic-tac-toe. In the story, the Wild Tick-Tack-Toe creature had a tic-tac-toe board on his stomach! Use a set of letters (here) instead of just X's and O's (although those could be good letters to start with!). You'll also need a Tic-Tac-Toe board (here). You can see how many letters and sounds your child knows by giving them a little quiz. Not in alphabetical order, show him each of the letters and ask "what letter is this?" After you've done that, you can ask "when your eyes see this (show a letter), what sound do you say?" To play the game, I would start by picking one letter/sound he knows and one he doesn't. For the next game, pick two he doesn't know. If your child is 4-5, pick a handful of letters to work on over a couple of games. Work on saying the name of the letter. You could even do numbers if you'd like. 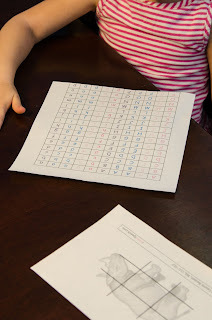 If you child is 5-6, pick a handful of letters to work on over a couple of games. Try to pick letters/sounds that he doesn't know. Work on saying the name of the letter and the sound that it represents. For example: S is "ssss" Try not to add an "uh" to the end of your letter sound (suh, fuh, buh, etc...) For some letters it'll be harder to not add the "uh" so make that as short of a sound as possible. If your child is 6-7, play tic-tac-toe in a boggle-style manner. Use a mixture of letters with each person having a different color. Have him say the words that are created as you put down the letters. If your child cannot sound out words, make sure that your child knows all of the sounds associated with letters. If he does not, keep working on developing that skill. If your child is 7-8, he should have fully mastered phonics/sound awareness. 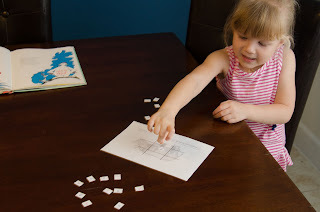 You can still play tic-tac-toe, but maybe use the 2nd Grade sight words instead of letters. However, if your child has not mastered phonics/sound awareness, this is a fun way to work on developing that skill. Tic-Tac-Toe is a fun game to play when you are waiting in a restaurant or in line at a store. Use a small board (here) or just draw one out on a napkin or scrap piece of paper. Pick the letters that each of you will use and go for it! Here are the links for the pages that you'll need to play! Where is the most creative place that you've played tic-tac-toe with your child?